LEAH'S CAKERY, 3 CURRY AVENUE, ROUND LAKE. 4:30 to 5:30 ~ FREE face painting makeup inside LEAH'S CAKERY. FREE simple carnival-style attractions and games on site. PRIZES FOR EVERYONE! 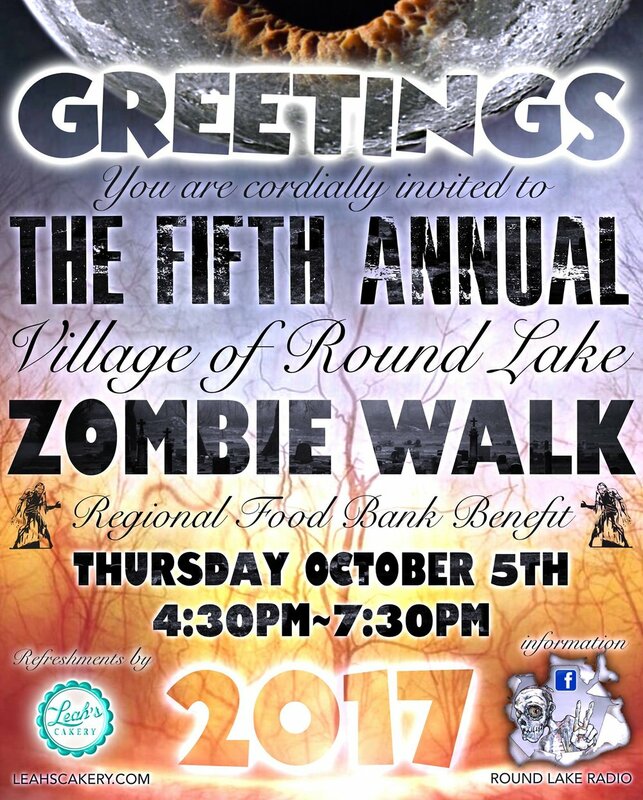 5:45 to 6:45 ~ The horde of newly created ZOMBIES shamble throughout The Village Of Round Lake collecting specially marked donation bags from the front porches of terrified citizens. 6:45 to 7:00 ~ FREE CINNAMON BUN "BRAIN" EATING COMPETITION AT LEAH'S! 7:00 to 7:30 ~ A spectacular FIRE-SPINNING DEMONSTRATION with glorious LIVE STRING ENSEMBLE ACCOMPANIMENT! This is so much fun for the whole family, AND you are helping the community at the same time. It's a win win, and it's the perfect event to start getting into the Halloween spirit. Click through the gallery to see our photos from last year's event, and click the button below that for more info, we'll see you there!